In the 1851 and 1871 censuses, William is 14 and 34, recorded in his parents' home. in the '71 census his occupation is Clerk. William, aged 24, does not appear in the 1861 census. He must have been at sea. 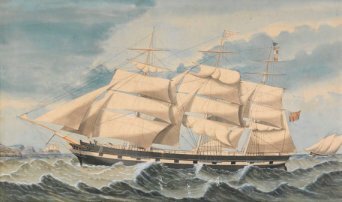 On the 18th August, 1857, William was at sea. He was off the Malabar coast, 200 miles from Bombay (Mumbai). William Tillotson's son Julian was born at 38 Crawshay Road in 1878, the year before this article was published. 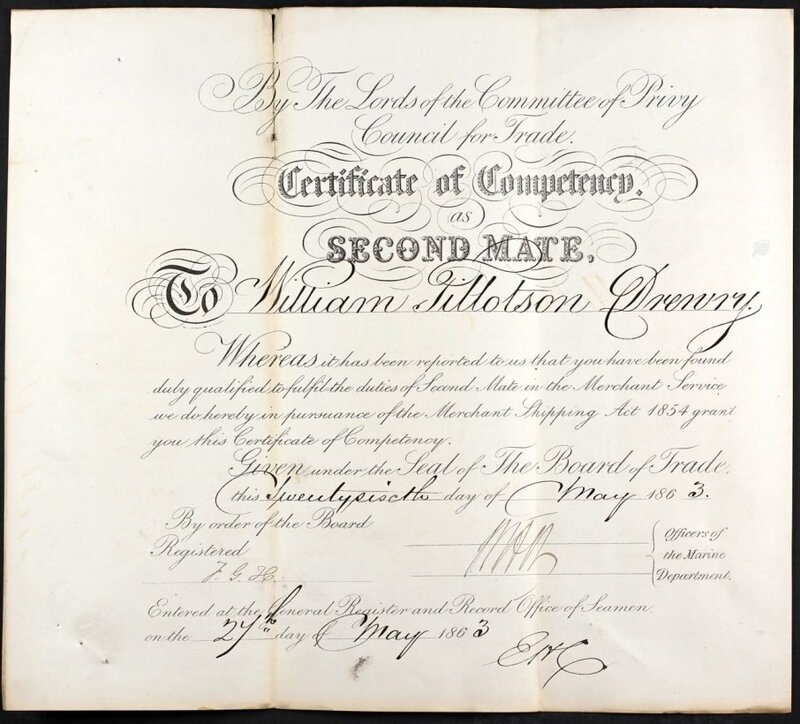 The service record of William Tillotson Drewry with the London & South Western Railways shows that he started with them in 1877 as a clerk, aged 41, and stayed with them until he died in 1895. The records are from two ledgers, one called "Weekly Paid" and the other "Clerical Staff Character Book No 3". William married Eliza in 1874, 3 years before he joined the London & South Western Railways. Had he already finished his sea-going career? Did Eliza make him stay ashore? His father's occupation is Barrister-at-Law. 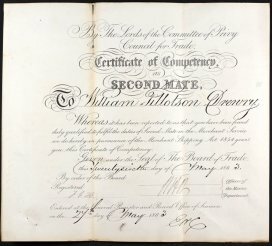 The Document is dated the 31st August, 1874, and signed by William. A Marriage Allegation was required in an application for a marriage licence (required when one of the partners is under 21 years of age. It says that Eliza was "a minor of the age of Seventeen years and upwards but under the age of Twenty one years." In 1875, William was witness to his brother Charles's marriage to Margaretta. In 1878, he was witness to Charles's marriage to Julia. In 1878 William's son Julian was born at home, at 38 Crawshay Road, Brixton. 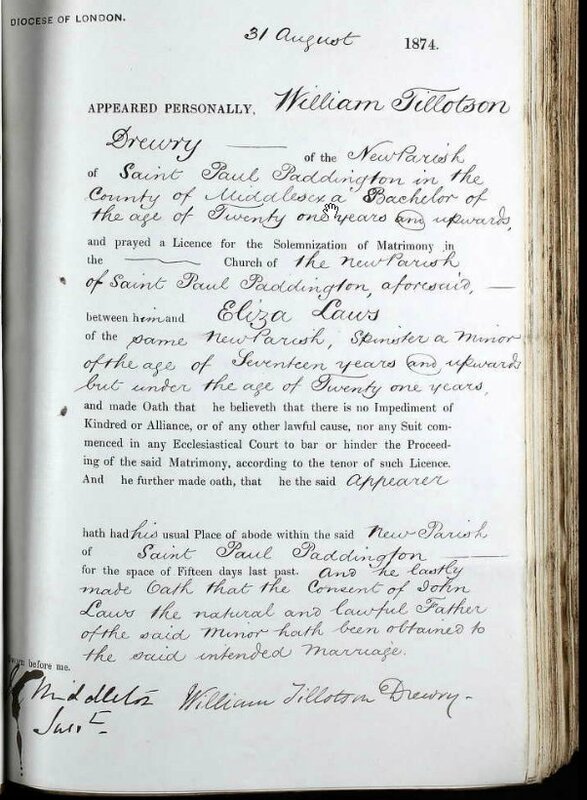 On the birth certificate, William's occupation is 'Railway Clerk'. In the 1881 census, the family is living at 81, Stockwell G; Lambeth. In the 1891 census, living at 22 Coburg Road, Teddington. Julian S. and probably Vere S. have died. William died 1895, aged 58. William Mansbridge is almost certainly a work colleague of her late husband. In Google Books there is a reference to "Death-bed Apparitions published by W T Drewry." 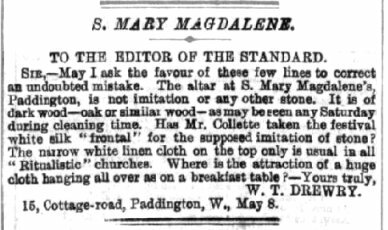 W T Drewry wrote a letter to the editor of the London Standard in May 1874. The address on the letter is the same as that used in his marriage certificate in the same year. Was William in the army for a while? See also The Edinburgh Gazette where William is shown in the 39th Company of the Staffordshire Militia. This might suggest that this William is one of the Staffordshire Drewrys.